Scotty's Surething Wings Site: Pattaya Stadium RC field having 2.4ghz radio interference? 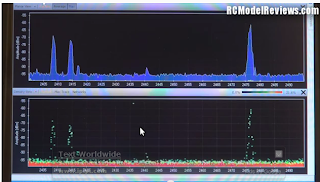 Pattaya Stadium RC field having 2.4ghz radio interference? I plan to continue to collect information on the theory of 2.4ghz interference at the Pattaya Stadium RC Field in the future. I'll try to report future crashes that are suspect and any other info that relates to the subject in updates bellow. Update mar 21, 2013 8:51pm: I did an analysis of the differences in RC radio modulation systems of a few of the more popular RC radios that I have seen at our RC field to see if I could determine witch might have a better chance of radio hits and why in the environment seen at the Pattaya Stadium RC field. To start I looked at the Futaba FASST system as that has done best to date at our field with the least number of hits per flight count. 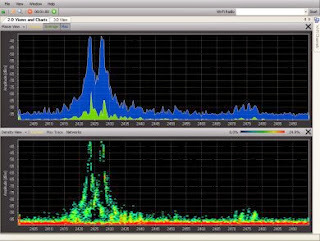 The FASST spectrum analysis looks like this: In more laymen terms of my looking at this I can see it uses FHSS that randomly frequency hops across the entire available 2.4ghz spectrum. It also seems to break the number of frequencies used into a very large number to best find some usable spectrum for reliable control. Going from the best to the worst of the system types I looked at the spectrum DSM2 system used in most of the older Spectrum RC radios and JR RC radios and is almost the same also with the Walkera Devention 2.4GHz systems like the Devo 4,8 and others that uses 3 frequencies instead of just 2 with DSM2. 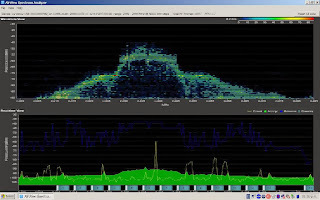 The DSM2 spectrum analysis looks like this: Devo 4 and 8 systems look like this with 3 instead of 2 spikes: The way that I understand DSM2 works is it scans the 2.4 ghz spectrum to find only two unused frequencies in the 2.4ghz band and those are used in the flight. In this case we will be scanning the 2.4ghz band at ground level and will see almost nothing in use when the selection is made. The problem is that at 400 feet up at our field there are 136 wifi signals that will be seen that will likely be on both of the chosen frequencies selected that will grately limit the usable range of this system. 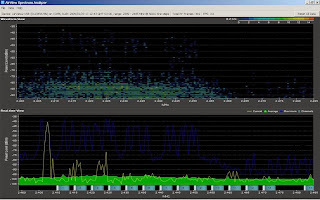 For the third worst it seems to be the TH9X Flysky and Turnigy 9X system that is a bit better than the DSM2 and Devo systems as it uses 16 different frequencies that are hoped randomly instead of 2 or 3 as seen in this image of the spectrum seen from a TH9X radio bellow: The problem with the 16 channels the TH9X uses is that they are all centered at 14 of the same channels as wifi uses. Also as we can see a single wifi channel when in operation really uses 3 overlaping channels for each as seen in this example of a single wifi access point: so it completely overlaps the the centers of the flysky system when all the wifi channels or even if only 1/3 are in use as is in our fields case with 136 wifi access points seen at 400 feet that cover every usable wifi channel. 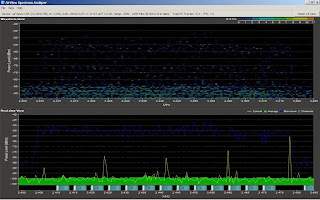 The last spectrum analysis images I have collected can be seen bellow that I have no info as to how well they work at our field as I don't know any one that has used one, but it would appear they operate more like the FHSS futaba with very fine random channel hoping that should make the newer hitec and DSMX systems work in theory as good or almost as good as the Futaba systems. hitec: DSMX used in the newer Spectrum and JR models: None of this information is conclusive, they are just my observations as I have seen localy at our field and information about the systems we make use of or could make use of there. Update Mar 6, 2013 7:56am: Yesterday thanks to Mr. Tom (also known as the flying Dutchman) for loaning us a Cornet SD15SA hand-held spectrum analyzer that covers the entire 2.4ghz band used by our RC radio equipment. I did a quick look at the spectrum at ground level at the center of Pattaya Stadium RC field from where we normally fly our aircraft from and see mostly just a flat raised noise floor of about 89dbm. I also took the device up to the top of the concrete stadium bleachers to the left of the RC field and took a reading across the entire top and see signals not fully covering the entire spectrum but about 60% of the noise floor is raised to levels of about 79dbm – 80dbm. So basically at even low altitude the noise floor is raised about 10db but there were no big spikes seen at this time that my wifi device with wardrive didn't already capture that could be added to the possible interference problem to desensitize RC receivers. So this only makes it a bit more probable that wifi signals are the only other source of most of the interference on the 2.4ghz band at the Pattaya Stadium RC field. I had thoughts of trying to fly this Cornet spectrum analyzer on my S3 wing to capture more data at high altitude using my small video recorder to capture info in flight but I find that none of my cameras are good enuf to take a useful picture of the the LCD screen of the Cornet in operation. Oh but I didn't think of trying the max hold function of the Cornet that will capture and record the strongest signals detected in a short flight at altitude. The problem with this idea is that it will see my 2.4ghz transmitter near launch time that will likely be the strongest signal seen. So I'll just have to think about this a bit more to see if it's even worth attempting or find someone to fly the Cornet analyzer in a 72mhz RC equipped plane. 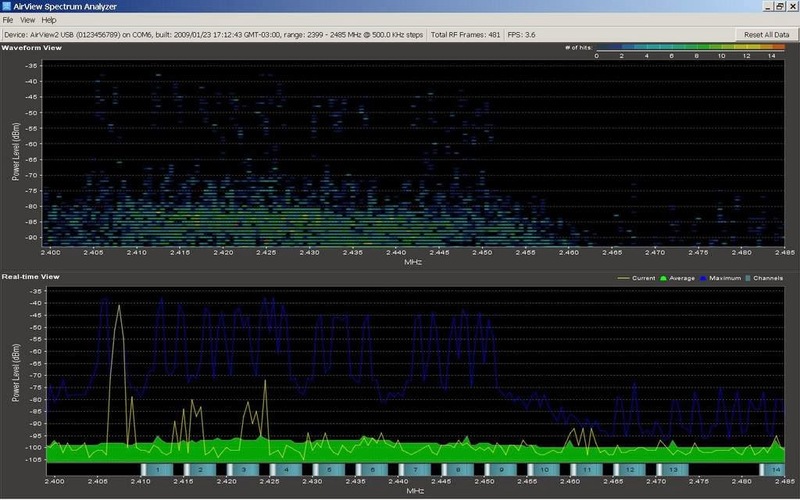 I also did a quick compare of signal levels as seen from my apartment patio in central pattaya where 2.4ghz signals are seen much stronger at levels averaging 73dbm over 90% of the measurable 2.4ghz spectrum on the Cornet, so things are much worse at the beach aria than at the RC field if that makes anyone happier. So things could get worse before they get any better. 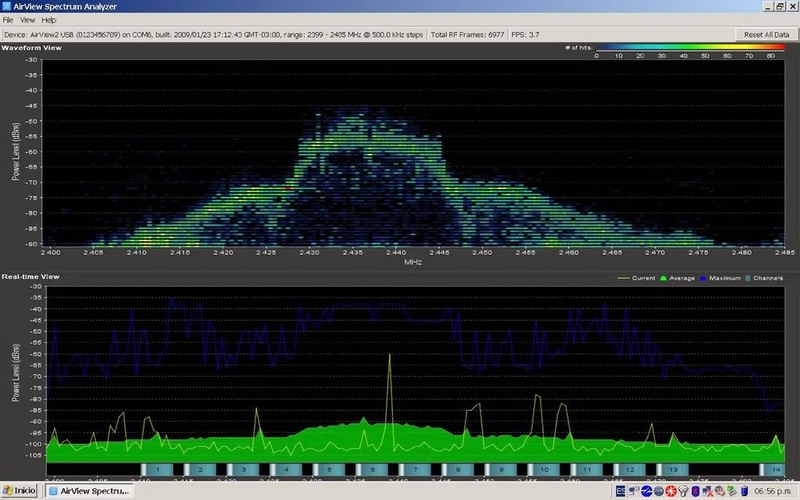 Photo above is a picture of the spectrum analyzer used in this measurement. The data on the screen of the device was not taken at the RC field. This photo was added just as a reference as to what instrument was used. Update Feb 12, 2013: I collected wifi data using wigle wardrive with my android phone that was flown on my S3 wing to all four corrners of the Pattaya Stadium R/C field ( 600 meter by 200 meter box) and cross patterns of about 50 meters apart. 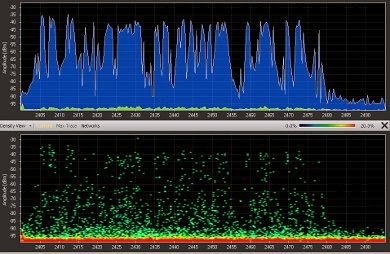 The data collected located 136 different WIFI access points seen with max signal levels of -66dbm and complete coverage of the 2.4ghz band with channels 1,6,10 was seen at levels no lower than -76dbm (25db above noise floor) as seen at an altitude no higher than 146 meters ASL. This is a much higher number of signals and much higher signal levels than I had ever imagined. Also note that the strongest signal detected in the 820 samples was -66dbm detected at the farthest North measurement far left side of the field at lat 12.893 long 100.921. So no wonder my radio gets hit on 2.4ghz on the far left side of the field. The raw data collected on this day can be seen on this link that is in compressed cvs format includes gps location of each collection point with a total of 820 samples taken. and a link to the wigle.net map page that I uploaded my data file too here . and looks like this at the time I uploaded my data on this date: Note most of the wifi activity seen in the data is on the far left of the flying field at the location that the the most r/c radio hits have been detected. In short I think wifi will definitely take over 2.4ghz radio spectrum (the same used for most of our new R/C radio equipment) and we will have to move to another frequency like 433mhz or back to 72mhz or other in the near future here in Pattaya or move to another physical location to fly from that has less wifi traffic. From my present calculation most radios here now on 2.4ghz will be limited to a range of about 200 - 300 meters instead of 5000 meters in a perfect world with no interference and this range will only get smaller over time as more wifi devices continue to move into the aria. 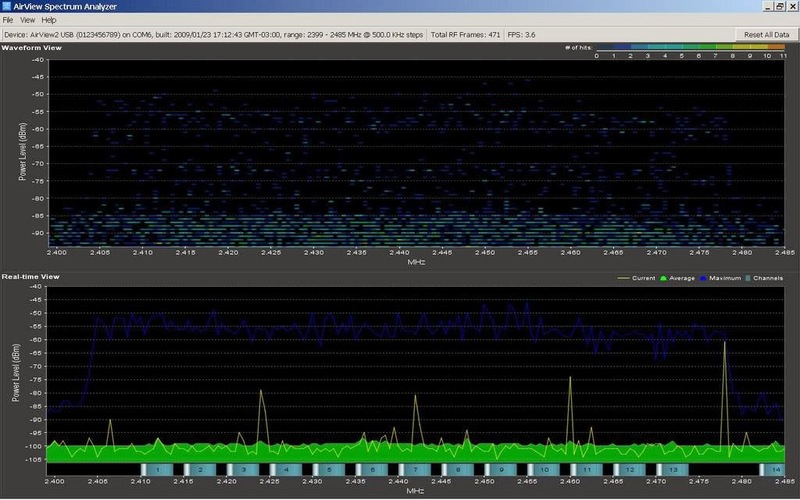 so be careful and do range tests often or you will be the next to crash with radio hits on the 2.4ghz band. And be aware of the signs of when you start getting radio hits with short control freezes to start. When detecting freezes try to at least avoid flying as far into those arias whenever possible. Know the limits of your radio. Every location you fly will be different. Update Feb 11, 2013: Yesterday Jim was getting Hits that were indicated by telemetry return warnings (beeps) that were indicating failure and short lock ups in control from his frsky TX module and receiver set in his Futaba radio when he got no more than 12 meters distance from the aircraft. He said he had never heard this before and I assume that he flys this same radio receiver set at the other R/C field here in Pattaya without this effect. Also he flew this same aircraft and radio here at the airshow a few weeks ago and didn't have this problem then. I spoke to Jim later after this event and was told he isolated this problem to a bad receiver that caused it. When replaced the problem went away. So this was a false data collection for this interference problem. Started Feb 8, 2013: For the last 2 days now I've been getting hits on two of my flysky receivers with my TH9X radio. Most often this happens as I fly to the far left side of the field a bit past the big tree. I start getting short 1 second freeze conditions that I now expect and prepare for when I fly near that location and have for the most part been recoverable. So now I just try to make it a point not to fly there and to push my flights more to the right of the field that doesn't seem to exhibit this same effect. 2 days before I also noted the old Thai man crash on that side of the field he said he didn't know what caused it so I assume radio failure. Yesterday we had Fabien note hits on his friends plane that had dual futaba receiver sets that Fabien said he was getting short freeze hits on 2.4 GHz that sounded just like what I have been experiencing. Also yesterday Lee ended up crashing only feet from the end of the left side of the field from a radio failure. We later found that his radio started to get hits on the ground test at less than 100 meters so this is probably unrelated and just a hardware failure, or is it? I also noted a helicopter drop out of the air yesterday for no apparent reason. I saw the young bald Thai guy later analyzing his broken copter try to find the reason but failed to find one at that time. Also note yestarday even after I myself had felt short deration freeze conditions on my S3 wing s/n 2 (with my small 3 channel reciever) that I range tested it and it tested good to 100 meters in test mode. note I test on the right side of the field. So are all these failures we just started having a coincidence or do we have some kind of increase in signal on 2.4ghz that might be part of the cause of some of them. I happen to know that 2.4ghz radio is used for many things including WIFI, microwave ovens, video transmission and other publicly available devices. 2.4 GHz is like one of the only bands that Thailand allows usage without a license so everything is starting to be on 2.4ghz. Also I have noted the proliferation of Wifi signal boosters being sold at tokcom and other places That drive wifi at signal levels of 10 – 100 watts or more. With the demand for Internet so high we end up seeing Wifi everywhere. I'm thinking ( hypothetical ) that maybe in the housing project that borders the left side of the field has setup a new high powered wifi Internet distribution system that might be a part of our problems. I plan to do an analysis of the wifi traffic in and around our flying field with my android phone in spectrum analyzer mode to see if this might be the case. 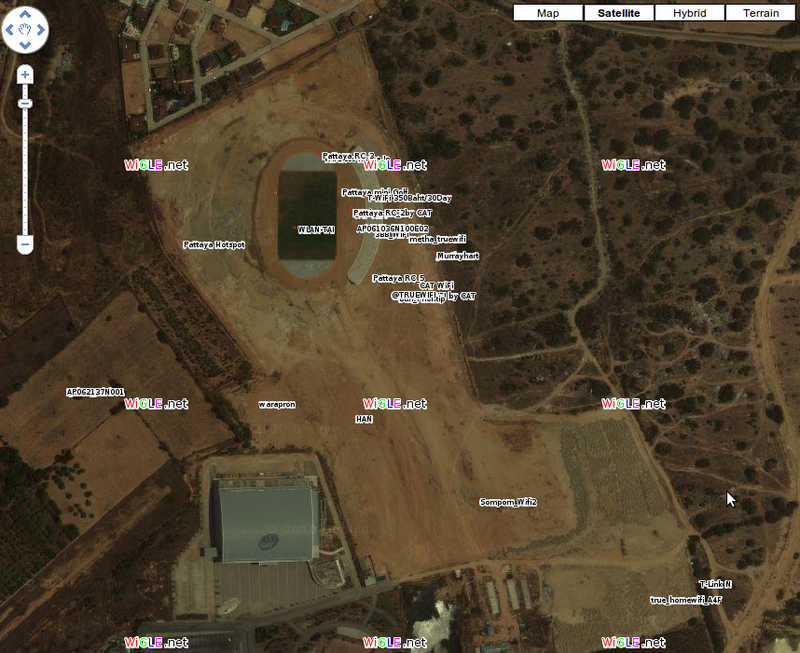 Update Feb 9, 2013: Yesterday I did an analysis of wifi thoughout the field at ground level and from on top of the far left stadium seats. 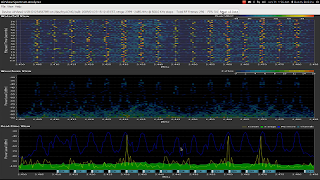 from the top of the seats I detected at least 6 wifi services at the same time covering the entire spectrum of wifi but all were at levels of between -85dbm to -95dbm putting them from 5 - 15db from the spectrum analyzer noise floor. This may lift the noise floor levels a bit on the left side of the field as compared to the right side but not to a point that I would think would cause any problems. One surprize was I was picking up at least one wifi signal from the center of the runway. As wifi is only designed to operate to 100 meters and we are at least 400 meters at that location from any civilization then there must be some wifi stations operating at some higher than normal RF signal levels to be seen at all from there. I continued testing the fields entire perimeter from the edge of the paved road on the far right of the field to the junk yard corner to the edges of the corner foot ball field (a box of 600 meters long by 200 meters deep ). The far right of the air field I would intermitently pick up only one wifi signal at a time. 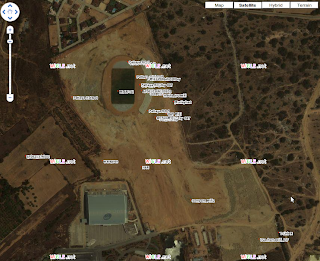 So in conclusion there is six times more wifi trafic on the left side of the field than the right. As I researched I see wifi with just channels 1, 6 and 11 active will completely overlap the entire spectrum of the futaba spectrum analysis I looked at that covers 2.40352 to 2.48272 ghz and this will be the same with all 2.4ghz r/c radios. So if just three of the now 6 wifi services seen happen to have a lot of Internet activity on them at the same time this can bring up the noise floor even more across the entire band we use. From higher altitude these signal levels might get even stronger as I'm at ground level in my present tests. With a total noise floor increase of 15db we would loose what would be equivalent to running our transmitters at 1mw instead of a normal transmitters power of 200mw that in theory in a perfect world would reduce range to about 200 meters instead of 5000 meters. Also note I did a range test of my radio again today and it seems to go farther than it did a few days ago. I also didn't detect any hits on this day as I tried to edge near the danger zone (left of the field). So maybe the bad signal went away on this day? I have one more tool I can try from my android phone with a program called wigle wifi wardrive that collects seen wifi trafic with the gps location and the radius they are seen into a cvs file. I can install the phone in my flying wing and fly the borders and cross paterns of our field for a few days and collect data with it and analize it. When this is done I will report it here. 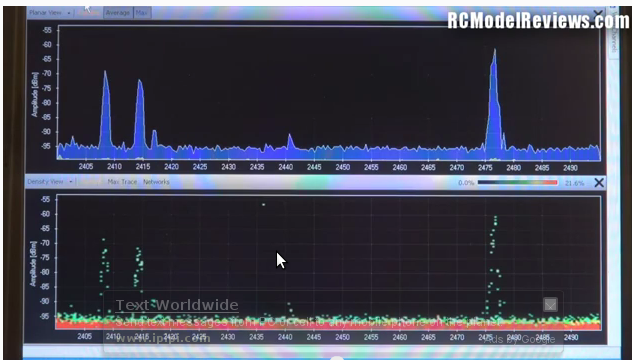 I tested this software in my building here in Pattaya PBC condo and detected 120 signals just from my patio. I hope it's not that bad out at the field. If so no wonder we are having problems on 2.4 ghz. To do any more real spectrum test we would need a full RF spectrum analyzer set that I don't have. Maybe someone knows someone that knows someone that can loan me one for a few hours to do a quick check of the field. I also found a cheap 2.4ghz spectrum analyzer for about $40 online here if someone wants to buy or barrow one. Problem with these kind of interference problems is they may only happen at random times and difficult to isolate with a short sample. Also note that the Cobra Gold military has arrived and flew directly over our field yesterday (the day of high incidence) with three full sized helicopters at an altitude of 500 feet at speeds of about 70mph. Maybe they are using 2.4ghz in some strange ways now and over the next week. Maybe the military has a button to shoot down 2.4ghz planes so they don't have a problem with them hitting there expensive helicopters? It's a mystery that we may never know and is probably just a coincidence that all 6 of our receivers have happened to fail within the last 4 days. In any case now is the time you might want to do a range test on your radios before you fly at the stadium field. If you didn't know there is a transmitter test mode on futaba and all transmitters to lower the power down 10db – 23db to test the sensitivity of your radio receiver. For me my test mode on my TH9X works at least as far as from the field tables to the right edge of the flying field that is about 100 meters. 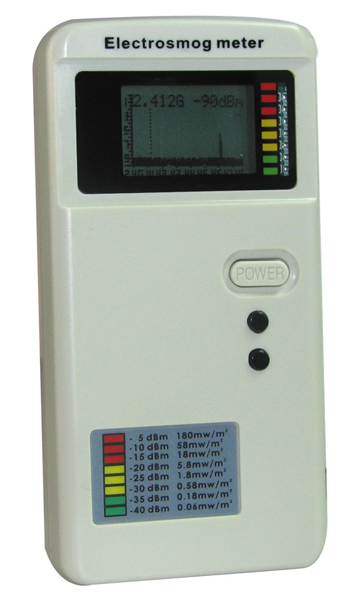 I researched futaba and they show that the “power down mode” that puts out about 23db less power or about 1 mw vs 100 – 200 mw thats been tested to go about 90 – 190 meters in “power down mode” with direct line of site no abstructions. To see how to put your futaba into “power down mode” see this link as he puts the left radio into power down mode by holding the button as he powers up the radio: http://www.youtube.com/watch?feature=player_embedded&v=XdP5Uxzy1XY I also noted this link that shows spectrum analyser power difference in futaba 14MZ with the 2.4GHz module when the "power down mode" is active here . I will just have to assume that this is the same or similar in there other models. I also noted for the more expensive touch screen futaba units the method is to touch the screen as you power up the transmitter, when it asks if you want “power down” press yes. Note the blue light will be blinking when you are in “power down mode”. Sorry I couldn't find a video of this and I don't have that radio to show you. On my TH9X I just hold the button (the same button used in bind) on the back of the transmitter to hold it in transmitter test mode. If you have another Futaba or other radios you can't figure out how to put into transmitter test mode or “power down mode” let me know and I'll figure it out and show you and add it here for others to benefit. I plan to repeat my range tests at the field to see if I note any changes over time (specially on days I detect we have more crashes than normal). I will try to repeat from the same location with the same polarization (point the aircraft the same way) and walk the same path away from my aircraft until I detect failure. Also be sure to polarize your transmitter antenna the same way when you test and don't put yourself in the path of the signal when you walk. I found that vertical (pointing up) of my transmitter antenna gives me best distance test results on the ground. As long as it's the same as your last test is what's really important, as I'm not sure vertical is best when in flight. This is the the best method of noise floor test I can do with what I have. We should also try to find an average distance and range of distances that we find most radios will operate in our field in test mode so others will know what to expect there test range to be here that they can expect will fly here without a problem. And maybe just think twice before you fly beyond the big tree to the left of the field if you fly with a cheap radio like I do. Oh and if you don't believe that any spread spectrum radio can be jammed. Someday I can prove to you with something that most of us including myself has in his house that will jam every radio (even expensive Futaba brands) on the field from 50 – 100 meters or more away. This device is called a microwave oven. Yes they operate on 2.4ghz too! All you need do to shoot down any and all aircraft on 2.4ghz is to override the safety door switch on a microwave oven and point the open door at the field. A microwave oven puts out from 800 – 1500 watts at 2.4ghz as compared to your radio that puts out max of 200mw (a small fraction of the power about 30db or 1000 times more power). This will lift the noise floor on 2.4 ghz far beyond what your receiver can ever detect as far as your transmitters signal. Someday I'll have to demonstrate this to prove to you and myself that it can be done. Maybe someone in the nearby houses to the left side of the runway just has a broken microwave oven that leaks 2.4 ghz? I do know that when I make coffee in my microwave oven that it slows and sometimes even cuts off my wifi trafic if I use my android phone's wifi too close to it.